For those of you who don't know, Positive Thinking Day is on September 13th. An American entrepreneur started this day in order to concentrate on all things positive. Thinking positively is not always an easy thing to do, but if you train your brain to know when you are in, or entering a negative state of mind, then the shift to positive thinking might just become a habit! 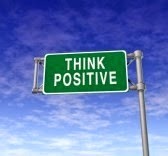 I do believe that positive thinking in general is an excellent topic to be sharing with any ESL learner! Here is a list of ten ways to create a positive day from the website www.positivethinking.com. This list could be turned into a group discussion. Have students give some examples that could reflect the points and also share experiences on how their own personal thinking has shaped their lives. 1. Use affirmations - Read and listen to affirmations so that you can begin to change your self-talk. 2. Intention - Set your intention each morning to have a positive day! Remember you choose your attitude! 3. Mindfulness - Keep your attention in the present moment. 5. Gratitude - Develop an attitude of gratitude by keeping a gratitude journal. 6. Inspiration - Read and watch inspirational and motivational material to lift your mood. 7. Positive people - Surround yourself with positive people. They will help you stay focused on the positive. 8. Kindness - Be kind to yourself and those around you. 9. Applied faith - Trust that every situation has the seeds for growth and opportunity. 10. Smile - Smile when you see others. Smile when you are talking on the phone. A smile is contagious. Pharrell William's HAPPY song on YouTube: A must to watch to change any negative mood! Enjoy and let me know if you have any ideas or activities about positive thinking in your ESL class!